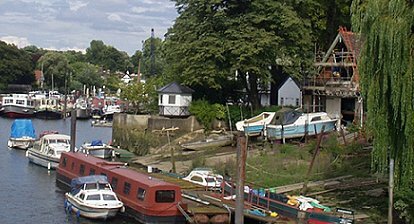 Those living and working on Eel Pie Island, on the Thames in Twickenham (in the London Borough of Richmond upon Thames), are a mixture of professionals, artisans and artists. An eclectic collection of buildings ranging from the "Love Shack" and highly individualised homes vie with contemporary architecture. Aquarius, a modern housing development, has been named in an attempt to recapture something of the island's past. 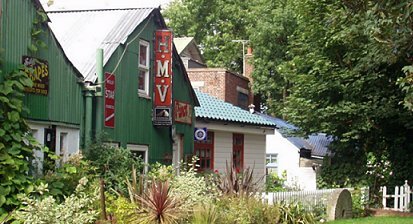 Approached from the mainland by a footbridge, Eel Pie Island is the stuff of legend - rock legend. Brian Jones, the ill-fated member of the Rolling Stones, played in the garden of Sunrise and, earlier, the Eel Pie Island Hotel, which burned to the ground in 1971, was the scene of traditional jazz. Some who live on the island do not want to publicize their way of life whilst others are keen to let the world know about this incredible place, a time capsule of easy living.